I enjoyed a lot of selfish sewing during summer, but I also managed to make a few things for my daughter. At the end of last year Little Monkey went through a significant growth spurt. It felt like overnight at least half of her wardrobe got too small! One of the things that needed to be replaced was her swimsuit. 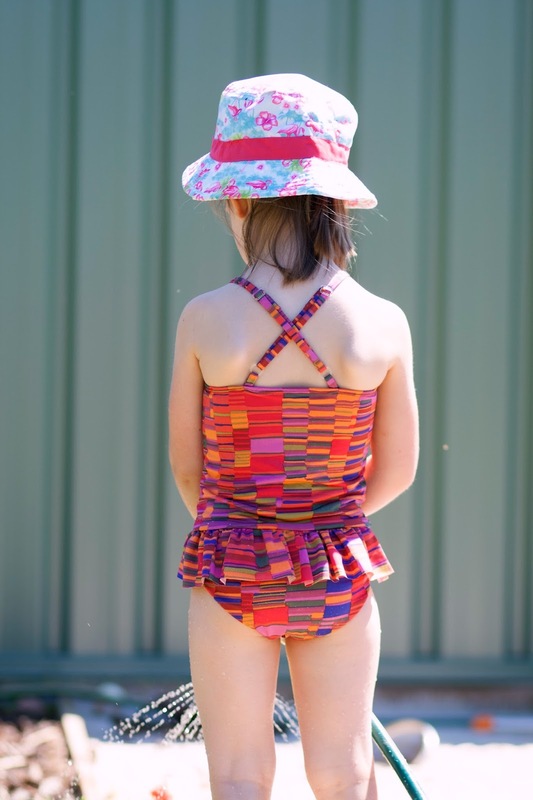 Little Monkeys goes to swimming lessons every week, so a new swimsuit was a top priority. So, While she was sleeping, I made a new Cosi swimsuit by Sewpony Vintage for my daughter. 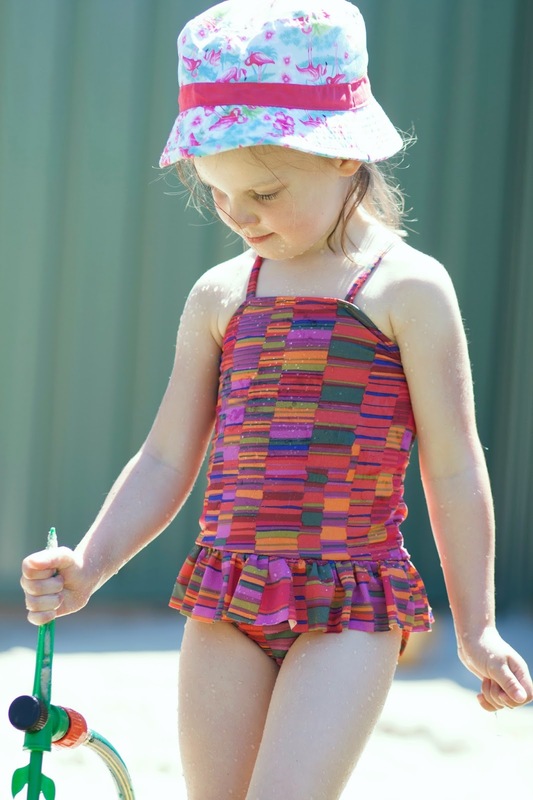 I used the same fabric as for her first swimsuit I made a few months ago. I offered to buy something different, but Little Monkey insisted I used her 'favourite' fabric. Swimsuits don't require much fabric. When I bought this brightly coloured polyseter knit fabric I bought about 1 1/2 metres as I was worried I would ruin a few swimsuits before I got one sewn right. Well, I only ruined one, so I probably still have enough of this fabric for two or three more swimsuits. The Cosi swimsuit pattern offers seven various views. 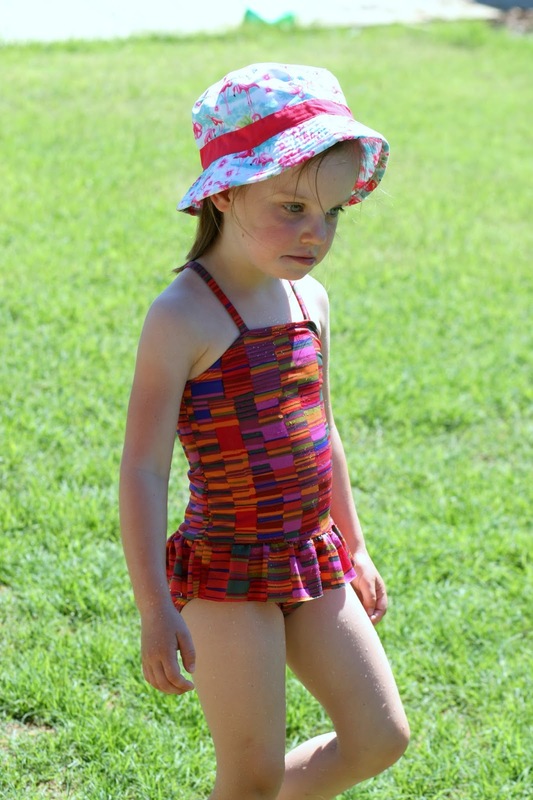 Little Monkey's original swimsuit was view C (minus leg ruffles). I have always loved view D and was keen to give it a go. My daughter however is not a fan of change. She wanted the same swimsuit as before, just bigger. I literally had to convince her to let me make her swimmers with a little skirt! Did she like her new swimsuit? No. She loved it! Her eyes widened and began to sparkle as she looked at her new swimsuit and said, "Ballerina swimmers!" I cannot even begin to describe the feeling I get when she loves something I make for her so much! This new swimsuit is fully lined. When I was sewing it I kept on thinking about Heidi's words that lining a swimsuit makes it legit :) It sure does! I cannot believe the difference in quality between this swimsuit and the first one! Practice makes (closer to) perfect indeed! I used regular elastic for Little Monkey's original swimmers. While it did a good job it felt a little bulky. Since I was giving myself a challenge of lining a swimsuit I thought I would also use clear elastic. It was much easier to sew and I think the finished product looks nicer too. I cheated a little and reused straps from Little Monkey's original swimmers. I am a slow sewist and I tend to rush things when I get frustrated. That's when I make silly mistakes or ruin things. Sewing stretchy fabrics is still in a frustrating category for me. To avoid getting frustrated I divided sewing process into manageable parts. First night I traced the pattern and cut the fabric. Second night I made the outer layer. Third night was dedicated to the lining and sewing elastic. I was planning to leave topstitching for the following night, but since my frustration levels were low I finished sewing the same night. Both Little Monkey and are are very pleased with her new ballerina swimmers. I am wondering which view I can try next time! Wow, did you make this yourself? It could just as well be from a shop, very professional looking! Thank you very much Mieke. This one looks muuuuuch better than the first one! 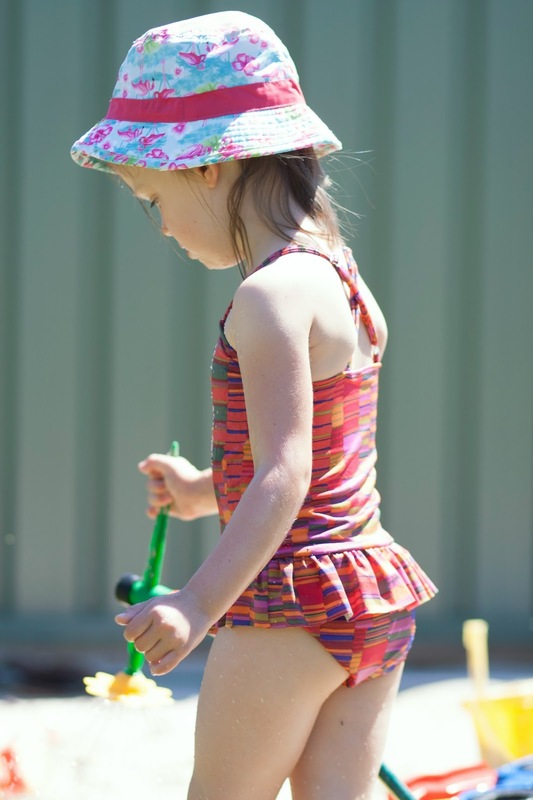 Sewing swimsuits is such a hard work... but the end result is so worth it! Yours is so pretty! Great job! Yeah, that is exactly how I ruined the very first swimsuit - I decided to just quickly sew the elastic in - haha That certainly did not work! Gah...looks so good! I love that fabric and the little skirt is adorable. Swimsuits are probably the only thing that is cheaper to sew than it is to buy...they use such a small amount of fabric! They are! I think I only paid around $8 for this colourfil fabric (it was on special though). Lining was dearer than that! 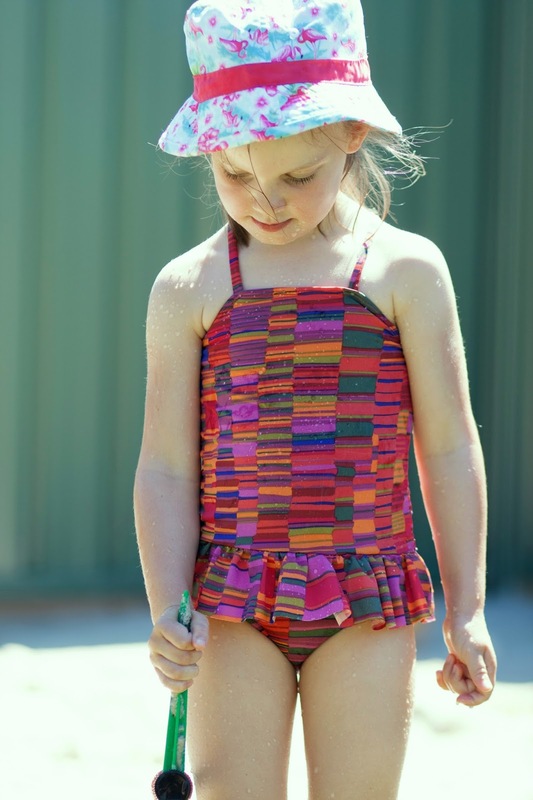 But because swimmers don't require much fabric I think I am saving a little fortune making swimmers for my daughter. Funny enough this fabric lasted much better in pool water than some store bought swimmers we had in the past, and it is only cheap fabric! Oh it is so sweet. 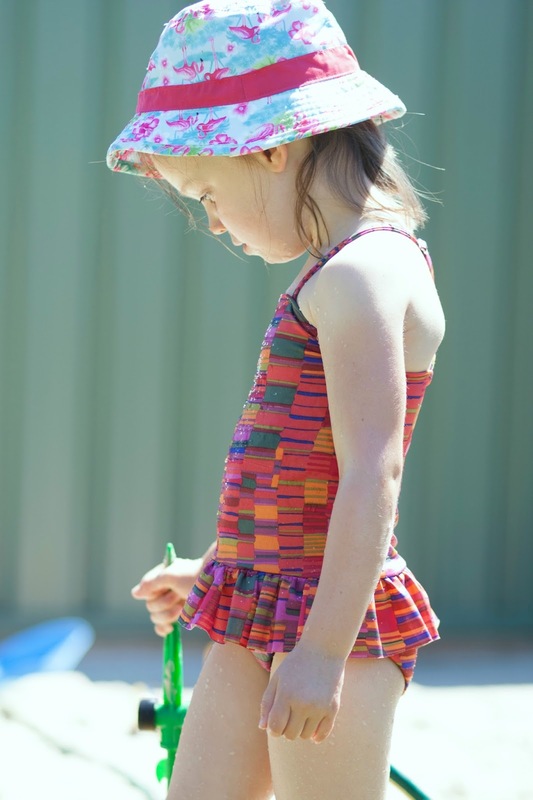 I really don't think I would ever attempt swimmers but like Monkey, my little girl goes to lessons every week and we seem to go through a LOT of swimwear with wear and growth. 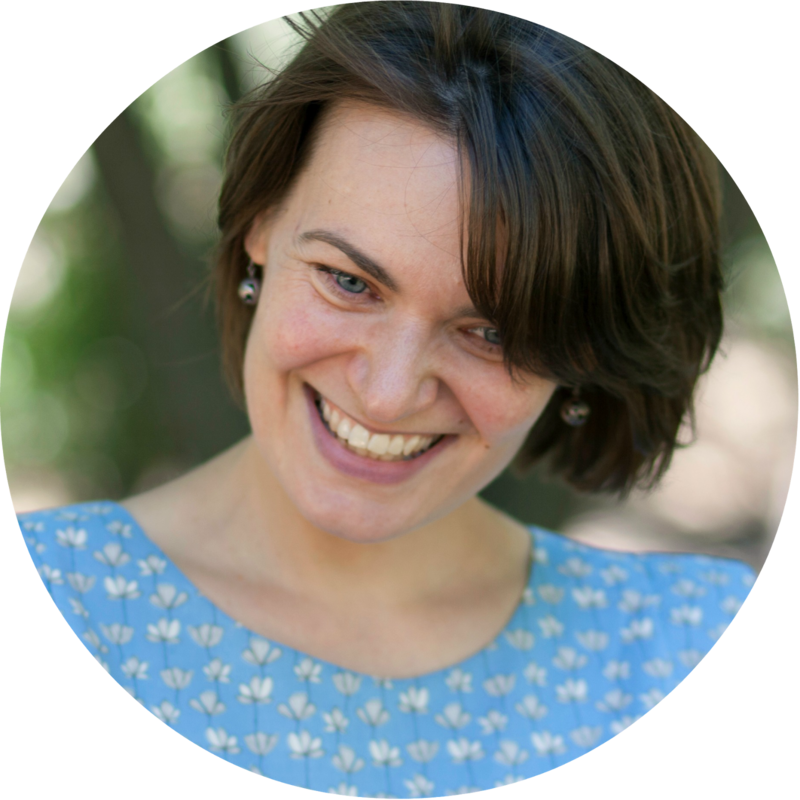 It is just lovely Jenya! I was horrified to try swimmers. People keep on saying it is easy. I would not say sewing swimmers is easy, but I am seriously intimidated by stretchy fabrics. It is much cheaper to make swimmers than to buy them, funny enough! love this so much! seriously looks store bought and the fit is perfection! Thank you Christina. I think I will buy a swimsuit for my daughter only in case of emergency! It turned out so cute Jenya! I love that you call them "swimmers", I think us Westerners need to adopt that ;). Thank you Abby. 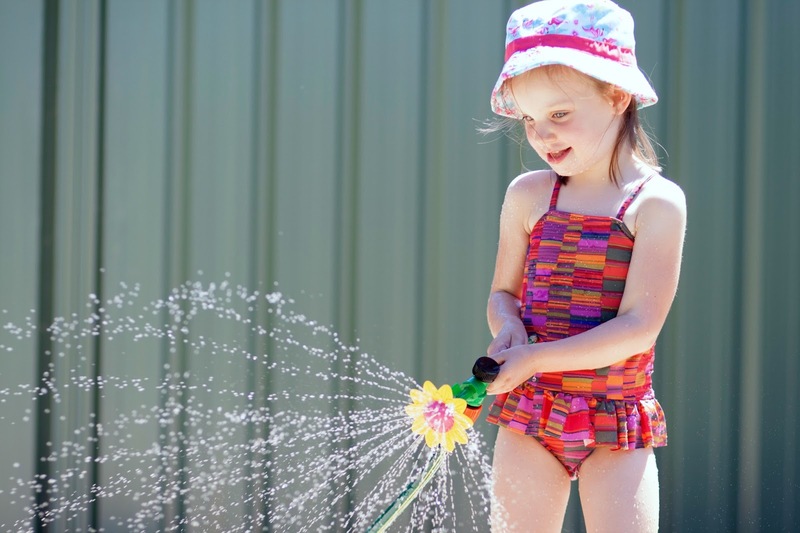 There are a lot of cute Aussie words for swimsuits. Swimmers, bathers, togs, cossies... Kinda depends on where you live. this is awesome and thank you for the great tips! i'm definitely cataloguing them for when I made another. When wet, some of mine were a little thin sans lining. And I do have some clear elastic now, too. Thanks again and this swimming suit is amazing! Jenya...this is amazing!! It just looks so profesh. Maybe if I start planning one now, I'll have it done by July. ;) And great fabric choice! That's how well in advance I need to plan to sew stretchy stuff! Off to read about your dress! Photos look amazing! Love this swim suit. I want one for myself. Still not up so sewing swim lycra though I think. Well done!